Claim your share of the lucrative ‘integrated solution’ business with the Complete Security Solution — an all-in-one, pre-integrated solution for best-of-breed video surveillance, intrusion detection, and access control. Single user interface & intuitive use – extremely appealing to end users! To find out how to successfully compete on more jobs and become more profitable with the Complete Security Solution. Physical security teams in healthcare, higher-education or commercial enterprise settings deal with incidents on a daily basis. While most incidents are considered small and routine – like a fender bender in the parking lot, at times they can be much more significant, like an attempted robbery or assault. For all these cases, the physical security team will record the details in an incident management system so that the data can be archived for legal reasons, for example to protect the hospital in the event of a lawsuit or criminal prosecution, or to provide insight so as to prevent similar incidents from happening again. Incident management software has traditionally been used for exactly that purpose: recording details of an incident once the incident has occurred (post incident). However, as the demand and systems have grown, software capabilities have evolved to now manage the entire incident as it happens, from the notification of an incident, to the response (or dispatch) through to the final reporting. These additional capabilities are mainly facilitated through a number of integrations that are now available with incident management systems. The same can be said about access control or video management systems. While they are still often used for their traditional capabilities, such as granting access to employees through secured doors or recording video for playback in case of an investigation, integrations have brought additional capabilities to these systems as well. C•CURE 9000 access control systems from Software House and victor video management systems from American Dynamics, both part of Tyco Security Products’ offerings, are global leaders in the access control and video surveillance markets and are deployed in many of the leading enterprises across the globe, including some of the largest healthcare and educational facilities worldwide. These platforms have now grown to include integrations with several types of both security and non-security related systems, such as: Elevator dispatch systems, Emergency communication systems, Time and attendance or payroll systems and even Incident Management systems, to name a few. The benefits of integrating your incident management system with C•CURE 9000 and victor VMS are clear as they can provide essential data to help in the notification, dispatch and reporting of incidents. a. The exact time the incident began. b. Actions taken by the security staff. c. How quickly the dispatch staff reached the scene. d. Video images of the scene as it unfolded. a. Details of suspected employee identity. b. Time of entry and exit for the employee. c. Video images of the incident. Of course, seamlessly and bi-directionally sharing information from disparate systems also greatly improves security staff efficiency. Where the security team used to have to search through many different systems to put together a comprehensive report for an incident, they can now pull the data they need from one single source. D3 Security Management Systems Inc. as well as Resolver Inc. are leading incident management software developers and their products are used various types of applications. They are also approved members of the Connected Partner Program from Tyco Security Products, through their integration with Software House C•CURE 9000 and victor VMS. “An event or alarm reported through the integrated access control and/or video system is often what starts the incident management process. Our customers extract a ton of ROI simply by not having to re-enter the information manually each time there is a dispatch response. At the other end of the spectrum, the more advanced customers will even push out a dispatch automatically, to the closest available officer, based on his or her GPS position, in seconds and with zero human intervention” says Gary O’Connor, Director of Strategic Alliances at D3 Security. “Integration with the onsite access control and video system has become a key part of an effective incident management system. Having data from both those systems helps our software optimize the dispatch of security guards as well as provide accuracy in the automation process of the overall security system”, says Brian McIlravey, EVP Corporate Security & Command Center Applications at Resolver. C•CURE 9000 from Software House and victor video management systems from American Dynamics also present the additional benefit of having the capability to send data from their integrated sub- systems through to the incident management platform. For example, a PowerSeries Neo alarm panel from DSC, integrated to the C•CURE 9000 system will provide even more data that can be used in monitoring and investigation by security staff. For more information about the C•CURE 9000 from Software House and victor video management software from American Dynamics as well the approved list of integrated partner products, please contact us at tspconnect@tycoint.com or visit the Compatibility Matrix. Web Access – HTTP and HTTPs which provide access to the camera’s web interface. If possible, disable HTTP and use HTTPS which encrypts the communication using the Transport Layer Security (TLS) protocol. You will need to load a digital certificate onto the camera if it doesn’t come preloaded with one. Remote Access – Telnet and SSH which provide remote access to the camera’s operating system. If you don’t need remote access to the camera and have the option to disable these protocols, do so, so that they are not available for hackers to exploit. If you need remote access to the camera’s operating system, use SSH if it’s available, as it encrypts the communication. File Transfer – FTP and SFTP which provide file transfer to and from the camera’s operating system. Like remote access, if you don’t need to transfer files to the camera’s operating system and have the option to, disable these protocols so that they are not available for hackers to exploit. If you need to transfer files to the camera’s operating system, use SFTP if it’s available, as it encrypts the transfer. Network Management – SNMP which is used by some people to manage and monitor network devices. Depending on the functionality supported by the camera, you can use SNMP to write commands to the device – for example re-configure the IP address, or read device status information to generate alerts. You should be using SNMP v3 because it has security features that overcome the weaknesses in v1 and v2c. 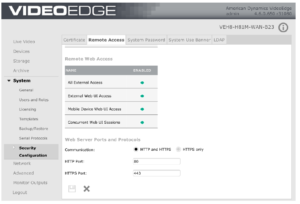 Post-based Authentication – IEEE 802.1X which is used to provide port-based authentication and authorization for devices to connect to the network. It will prevent malicious devices from connecting to your network, which helps improve security if your cameras or their connections are physically accessible. To use 802.1X you will need to set-up an authentication server and an authentication method such as Protected Extensible Authentication Protocol (PEAP). Reviewing your camera’s protocols will provide you an opportunity to make sure it meets your site’s security needs. This is not something you should do once and then set it and forget it. You should conduct this review periodically to make sure that it still meets your needs and make any changes that are necessary. To learn more about the Cyber Protection Program visit our website at tycosecurityproducts.com/CyberProtection.aspx. For any questions you may have on the Cyber Protection Program, email jeffbarkley@tycoint.com. Interested in becoming our next Technology Partner? Come meet us at ISC West on April 5 – 7, 2017 in Las Vegas, NV. Tyco Security Product’s security integration platforms, built by developers from across all product disciplines, allow our customers to see more, do more, and save more. With the most trusted brands in security in one portfolio, we offer the most comprehensive range of premium Video Management, Access Control, and Intrusion Security solutions in the industry – an unbeatable combination from a single source. For more information, please fill out this form and a sales representative will be in touch with you. Software House™ technologies are currently installed in over 200 of the Fortune 500 Companies, touching all vertical markets. Software House identified and developed a market niche for sophisticated software-based computerized solutions to manage and integrate diverse security hardware devices. Software House solutions include the innovative C•CURE 9000 security platform, which, combined with a suite of reliable controllers provides the most powerful security and event management in the industry. Under the Connected Partner Program, C•CURE 9000 can now integrate with 300+products empowering it to become the nucleus of a holistic security event management environment. American Dynamics continuously advances video technology via its IP solutions, while leaving no customer behind by ensuring backwards compatibility at every step. The American Dynamics portfolio features everything required for a complete, state of the art video surveillance system including a powerful enterprise analytics platform. American Dynamics solutions work seamlessly with Tyco Security Products access control products, as well as with most other key business applications, to provide customers with greater ease of operation and faster access to the information they need in critical situations. Kantech offers a full suite of feature-rich and cost effective access control products that are reliable, easy to install and fully scalable. From its KT-300 and KT-400 door controllers to its integrated INTEVO, and KT-1 door controller with single button enrollment, Kantech has redefined the user experience for small to medium sized businesses globally by offering innovative and technologically progressive solutions that are easy to deploy, configure and manage. Kantech access control technologies are ready to use right out of the box, providing solutions that are compact, and easy to use for smaller businesses while scaling to meet the needs of larger businesses. Kantech solutions can easily link to American Dynamics and Exacq video systems and to DSC Intrusion panels to provide an integrated, holistic security solution. Exacq Technologies is a leading manufacturer of video management system (VMS) software and servers used for video surveillance. 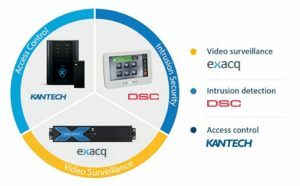 Exacq Technologies designs and manufactures the cross-platform, open-architecture exacqVision video management system (VMS) used in the physical security industry for IP video surveillance. The exacqVision line of hybrid and IP camera servers provides a complete, out-of-the box VMS solution. exacqVision hybrid servers seamlessly integrate analog and IP cameras, allowing customers to utilize their existing surveillance system and easily upgrade to the latest IP technology. The new Ludgate site, a high-end central London multi-zone development, required a new integrated security solution. Systems such as video surveillance, access control and video door intercoms combining to create a total security solution using a single interface. Together, Universal Security Systems and Land Securities chose Tyco Security Products’ C•CURE 9000 Security and Event Management system to unite the New Ludgate buildings’ management, access control and video surveillance systems for comprehensive management of the site’s physical security. This letter serves as official notification from Tyco Security Products that Proximex Surveillint Enterprise and Surveillint Essentials will be entering Maintenance Mode. Tyco Security Products will continue to provide support services, critical software patches, and integration updates for Releases 7.1, 8.0 and 8.1 until May 31, 2020 for customers covered by a software support agreements (SSAs). After this date, all support services for the products are unavailable and the products will be obsolete. If you have a software support agreement (SSA) you will continue to receive support until the end date of the agreement. You may continue to renew your SSA in one (1) year increments until January 31, 2019. Support agreements will no longer be available for sale after this date. 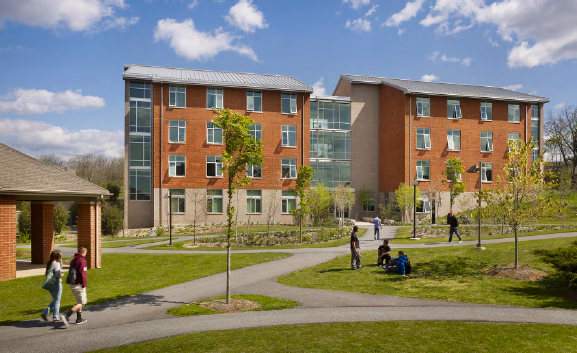 Penn State University wanted to move to a single security and event management platform for its residence halls and other group facilities on campus. Penn State selected a unified Tyco Security Products solution to protect and manage its campus. Tyco Security Products announced that Software House C•CURE 9000, the access-control powerhouse, now integrates with Guardian Indoor Active Shooter Detection System by Shooter Detection Systems, the world leader in gunshot detection technology. With gun violence reaching epidemic levels, this powerful combination of C•CURE 9000 and Guardian gunshot detection reduces the margins of human error, ensuring that there are no costly false alerts while enhancing the overall security of any school, business or public venue building. In 2016, approximately 53,920 incidents related to gun violence took place in the U.S., ranging from injuries, accidental shooting up to defensive use. 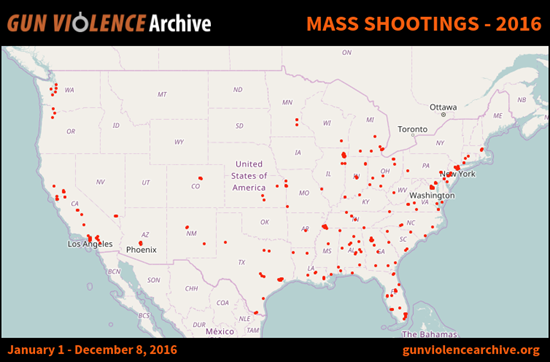 Out of 363 were related to mass shootings, killing 429 people and wounding 1,473, according to the Gun Violence Archive, which catalogues such incidents. A mass shooting is defined as a single shooting incident which kills or injures four or more people, including the assailant*. In an active shooter event where every second counts, the Guardian Indoor Active Shooter Detection System combines an acoustic gunshot identification software with infrared camera gunfire flash detection. When combined with powerful C•CURE 9000 event management and access monitoring features, the system provides the ability for instant shot location information, lock down procedures, live and recorded video from cameras in the incident related areas, and provides immediate notification to first responders through C•CURE 9000’s event action and integrated notification platforms while alerting monitoring facilities around the globe. The nation’s top 500 enterprise security executives surveyed named the Active Shooter as this year’s top security threat facing their enterprise. This highly anticipated integration complements Tyco Security Product’s offerings with an industry-leading solution to accurately detect gunshots and provide precise location information to first responders and security professionals within a second of the first shot, without the need for human interpretation. A recent analysis of Internet of Things device traffic identified various IoT connected devices that were exhibiting potentially dangerous behaviors including using plain-text HTTP protocol for authentication or firmware updates, leaving them susceptible to sniffing and man-in-the-middle attacks. As part of its Cyber Protection Program, Tyco Security Products considers security at the beginning of the product development process resulting in features and capabilities needed to secure the product in its environment. 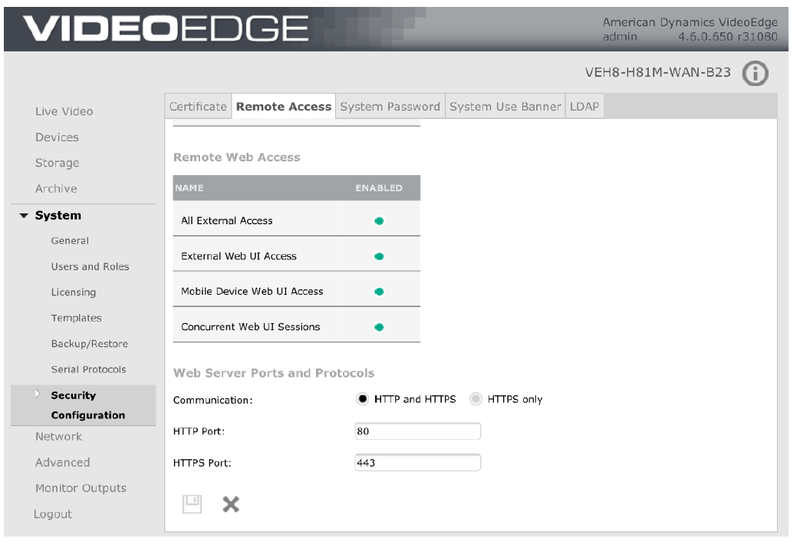 For example, VideoEdge NVRs provide a Security Audit page that allows integrators and end-users a single view of their security posture of the device. The audit page is an important tool for customers, giving them visibility on all accounts with remaining default passwords, enable / disabled status of ports and protocols such as HTTP, TLS certificates, and user security configurations such as password complexity, auto logout, account lockout. Tyco Security Products’ is committed to cybersecurity. Our holistic Cyber Protection Program combines best practices in secure product development, testing and evaluation, rapid response to potential vulnerabilities, and configuration guidelines for compliance.